It was a 4 trip kind of day today with moody skies clearing to a patchy blue sky over a picture perfect ocean. 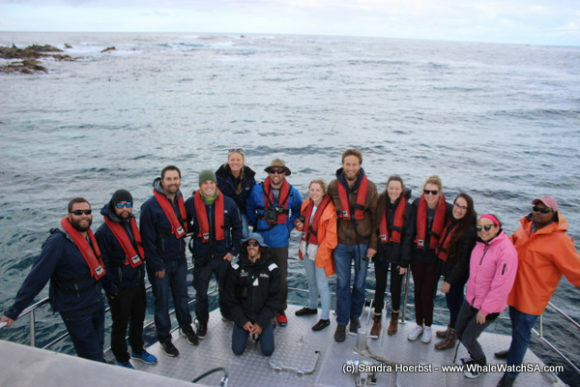 Our first trip of the day hosted some shark delegates from the recent Shark and Ray Symposium which took place in Hermanus. We took a quick cruise through the bay, with our first stop being in water less than 12m deep, which is where we usually find our shark cage diving vessels. 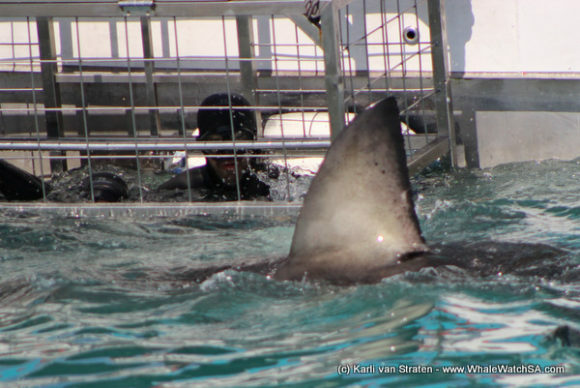 We were lucky enough to be able to show these fish fanatics the oceans most iconic predator, the Great White Shark. 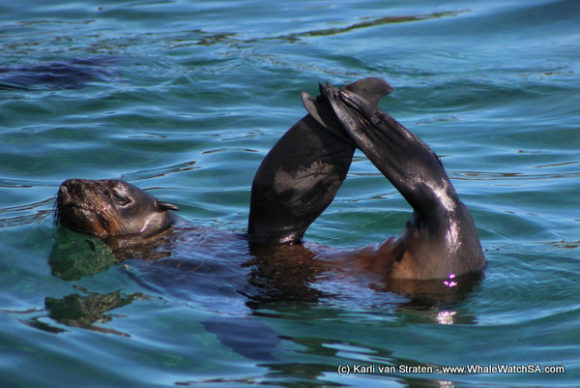 After having seen their favourite animal, we also took the delegates through to see the White Shark’s favourite snack, our Cape Fur Seals. With a colony of 60 000 strong, these blubbery beasts certainly attract a lot of attention to the area with just under 1 000 of these Great Whites estimated to be moving through the area. After this stop, we head back to the harbour spotting some Cape gannets and a Shy Albatross on the way. 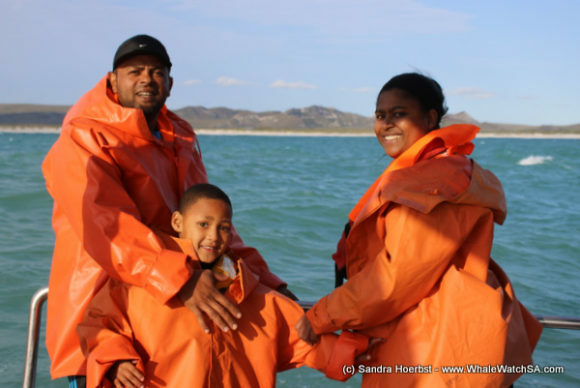 The second trip hit the jackpot, managing the Marine Big 5 in our 2.5 hour excursion. It all started with a juvenile African Penguin, which was a particularly special sight today as it meant that two of our clients have now seen every species of Penguin in the world, of which there are 17. 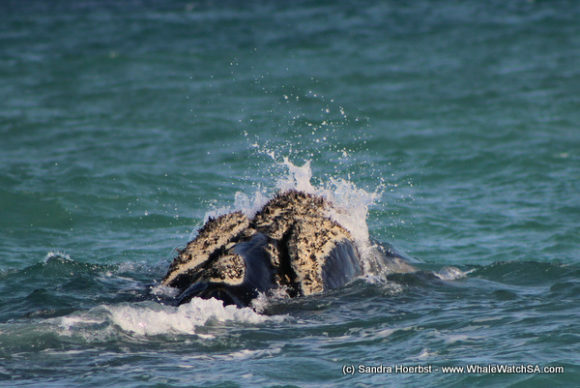 A Southern Right Whale made an appearance shortly after this and man, did this sub adult give us a show. 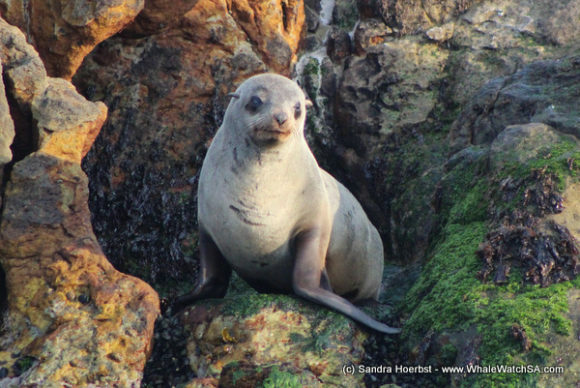 This cutie gunned straight for us during the sighting, coming super close to check us out before moving off. The next of the big 5 was a rare Indian Ocean Humpback Dolphin in the breakers followed by a White Shark swimming freely between the boats. 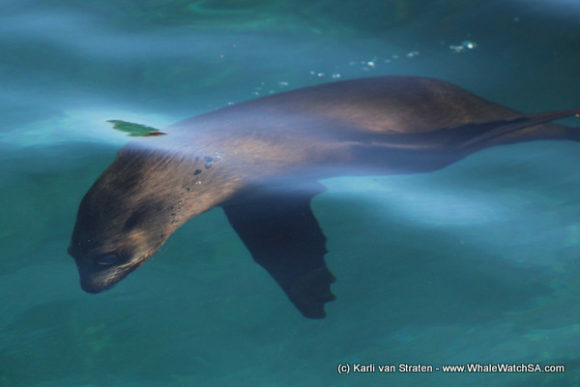 The Cape Fur Seal was last but not least and after a generous amount of time watching the colony, we head on back to Kleinbaai. 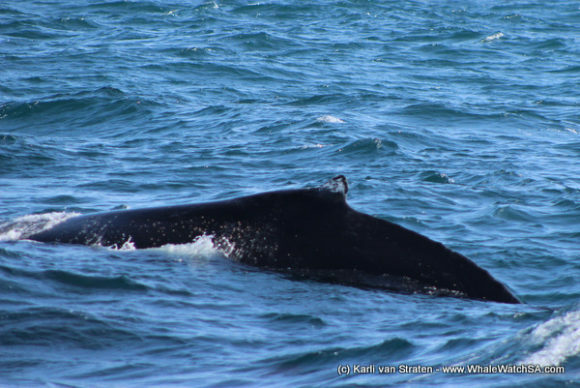 The 3rd trip got lucky with the whales, sighting two different species. 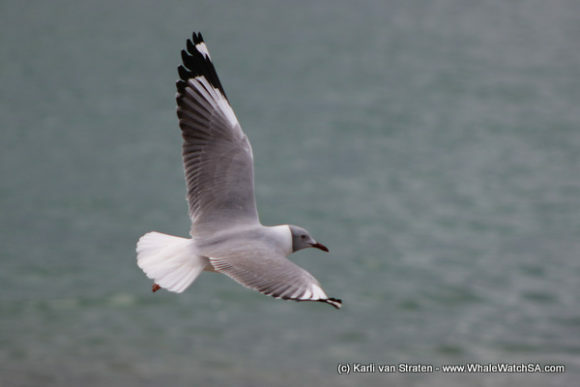 The first was the Southern Rights, of which we found 2 just in front of Ulienkraalsmond estuary, which is getting ready to burst back into the ocean. 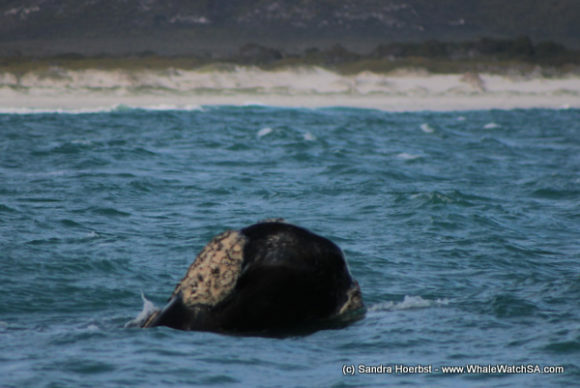 The next was a gorgrous sub adult Humpback Whale just behind Dyer island who gave us some awesome sights, coming up repeatedly and even teasing us with one of those long pectoral flippers. This trip also had an amazing shark sighting with a few White Sharks putting on a show in Jouberts Dam. 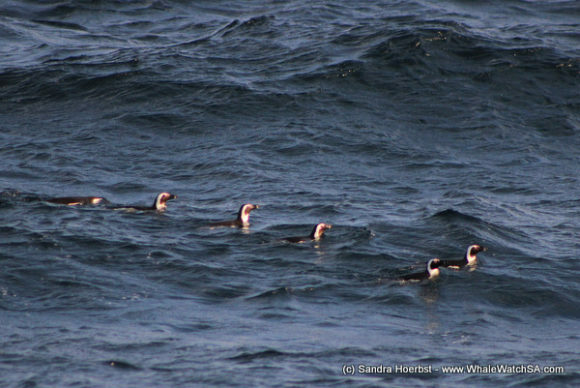 The 4th trip of the day managed 3 of the Marine Big 5 with an awesome mating group of Southern Right Whales – which include a half brindle female- and a lovely large raft of African Penguins. We typically find these large rafts around the golden hour, just before the sun sets when they are all heading home from a long days fishing. 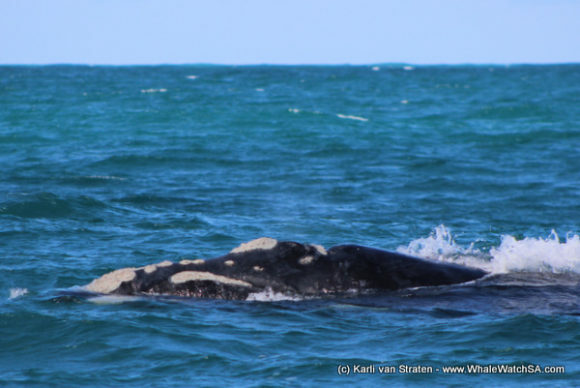 If you would like to get hold of your trip footage, please download the credit card authorization form here to complete and forward it through to bookings@whalewatchsa.com. Please be sure to mention the date and launching time with response. Our team will reply with a direct link to your video footage for download, please allow 72 hours to footage to be uploaded. Download link will be valid for 6 months.